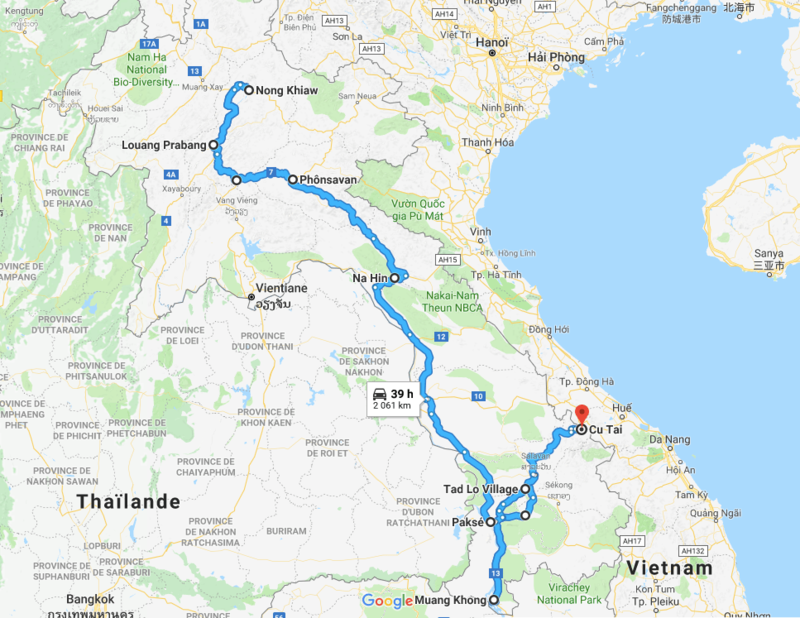 Laos from North to South – Always Look Back ! 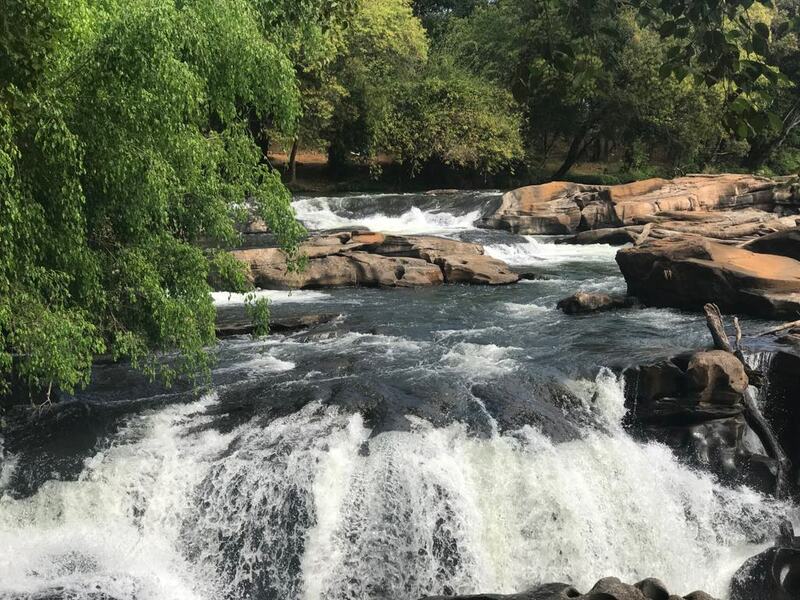 Laos is an amazing country where I met Rafica, a french girl I will share my travel with from Luang Prabang and its nice waterfalls. 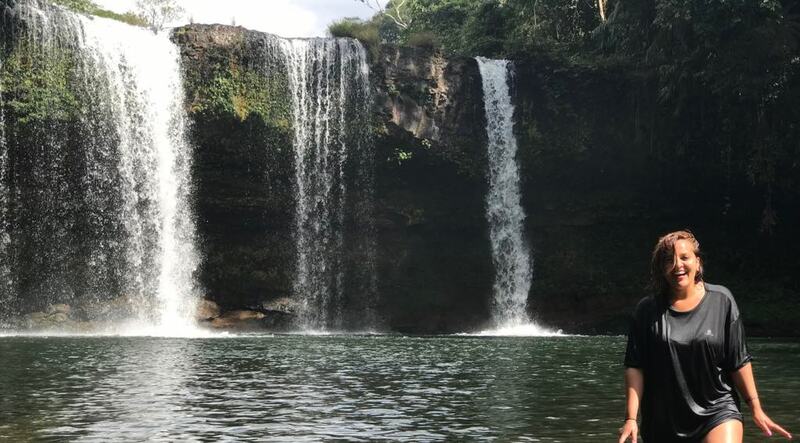 We went to the North in Nong Khiaw, before taking the South direction, to go to the plain of Jarres, Na-Hin and its 7km cave, Paksé and the Bolaven plateau, to finish our trip in the 4000 islands. Arrived in Luang Prabang after a 2 days boat trip from the Thai border, I met Rafica and we passed the night taking drinks in one of the Mekong river side. Every evening there’s a market on Sisavangvong Road full of clothes, “artisanal stuff” and other touristics items. The hotel where we stayed also offer a relaxing view on the river and on the small wooden bridge. We enjoyed one day around the city and its temples, including the most touristic sunset I saw in my life : on the Mount Phou Si. The day after we rented a scooter to go to the famous Kuang Si waterfalls in the south. Our hotel offered a tour for 40000kip but we prefered to have our freedom and pay 110.000 the scooter (90.000 the semi automatic). So after 1h ride on a quite damaged road, we arrived to the entrance where you pay 20.000Kip and have access to a bear preservation center, before discovering the shinning blue waters of the river. The minerals of the stone give to the water this magic colour, and you can find different swimming areas and a trek way to go up the biggest waterfall. After more than one hour walking there, we took back our scooter to go to the « cave and spring water restaurant » we saw on our way. The road to go there is pretty sleepy, and most of people prefer to walk until this peacefull place beside a river where we had a great lunch. We paid the entrance of the cave because we were there, but I’m not sure it really worth it, it’s just a small tunnel in total darkness (they pass you a lamp) with small bouddha statues inside. The day after I followed Rafica to the north, in Nong Khiaw. 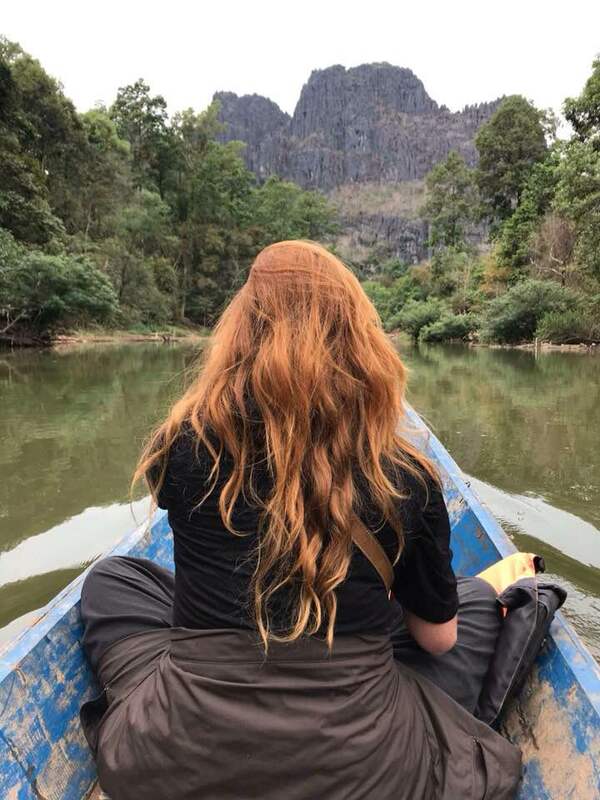 From there, the original plan was to take a boat to Muang Ngoy, a small village lost in the jungle, sleep there, enjoy a full day in the middle of the jungle, and go back the day after to go to the South. Arriving to the bus station, we saw a direct bus to Fonsavan every day at 10am (it was printed on a paper dated from november 2017, so few months ago). So we’ve been to the port to check at what time the boat was leaving, and the way back. So there was two boats : one at 10.30am, the other at 2pm. But to go back there was only one boat at 9am, arriving too late for our bus (the boat takes 1h30). So we found an hostel and tryed to find a way to go there by ourselves, but the private tour was expensive, and it was so raining that we decided to stay just for one night. A guy from an agency told us Phonsavan bus didn’t exist. So we’ve been to see by ourselves : Yep, no direct bus, you need to go back to Luang Prabang. So that’s what we did, waiting to the bus to be filled in before going at 2pm. 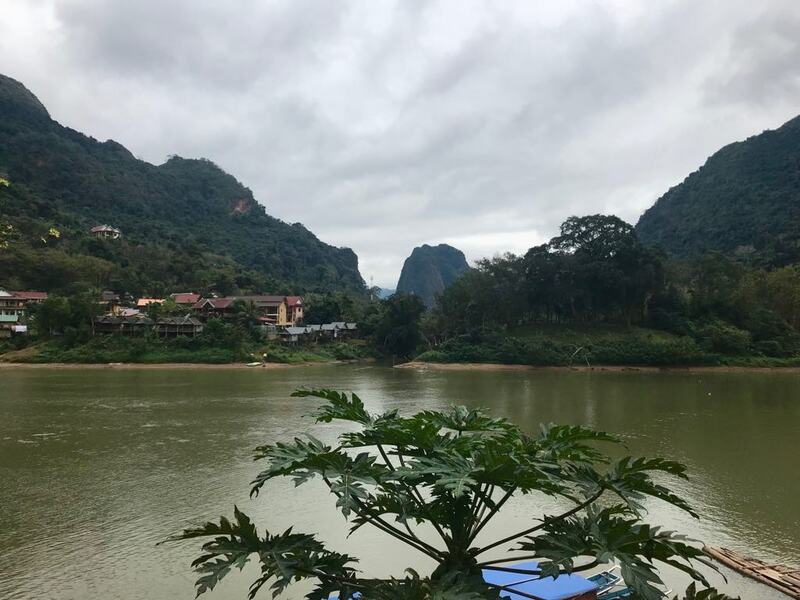 It was arriving right on time to take the bus to Phonsavan at 6pm, but Rafica thought she forget her passeport at Nong Khiaw, so we stood one night there, and finally took the bus in the next morning (her passeport was in a pocket of her bag). So we took the bus in the morning, but good to know: you also have one at 6pm to travel by night. You don’t have nothing to see in Phonsavan, we arrived in the evening and rented a scooter to visit the area and famous Plain of Jarres. There are 3 diferent sites, and after visiting the first one which is supposed to be the more interesting, we decided to pass the rest of the day looking for the Old Town and an ethnic village we saw on the map of the agency. We lost ourselves in the small towns and finally found the ruins of the Old Town. We don’t really know if we saw the ethnic village, but we saw lot of villages! To arrive to this small village close to the cave we wanted to visit, we had to take a bus to Lak Sao which left us at a crossing where we waited a tuk tuk. We arrived at the sunset and found an hotel. The day after we had a tuk tuk leading us to the cave. When you arrive you just pay a small fee for the entrance (20.000) and then pay the driver for a boat, the price depending on how many people you are. We paid for 2 people 110.000 and started a trip inside the mother earth in a total darkness. At one point you jump off the boat to walk a little in very nice formations lighted by colourfull lamps. Then you have a second ride to the exit, where you need to jump off again and help, foot in the slippy water, the boat to pass the rapid pulling it ! It was fun… and you arrive on a nice river, all green again, and have a break on the riverside where you can find shops and restaurants. Then you need to go back to the same way, for a 30min ride in the darkness ! It was an amazing experience! From Na Hin we took a bus to Vieng Kham and an other to go to Takhek and changed here for a bus to Takhnek, and changed again for Paksé. It took 8h30 hours! We arrived dead and by night again at 8km from the center, with no negociation possible with the tuk tuk (10.000 per person)… We found a room and enjoyed the day after preparing our trip to the Bolavens plate, and went to see the sunset in “Le Panorama” restaurant. The agency to rent a scooter gives you a map with the most important (and touristic/commercial) sightseeings. 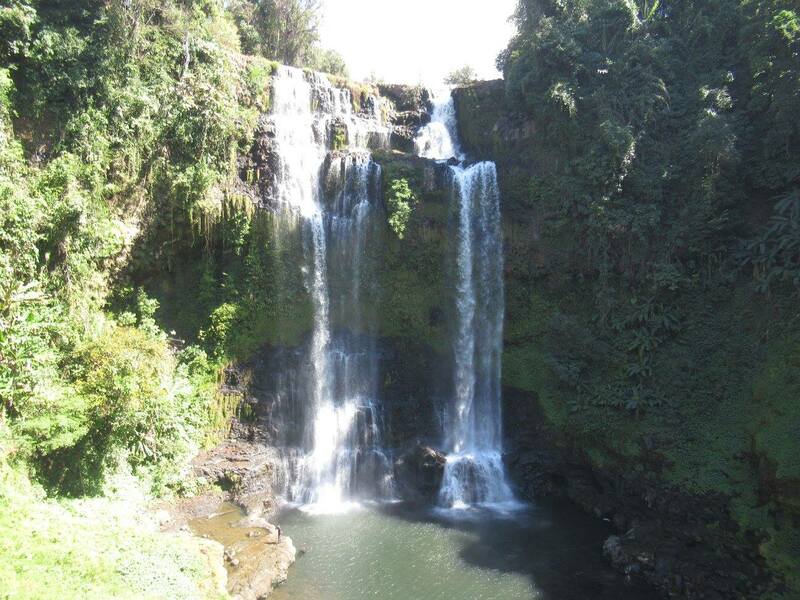 So we first went to a waterfall which was’nt on Maps Me: Tad Champee, and swam there all alone! It was gorgeous but without beach, just the stones to dry before going back on the road… We made a small stop to Mr Vieng coffee plantation, as it’s the region, and arrived at 3pm in Tad Lo waterfalls where we just took some pictures (but I think it’s a great place to swim), and we went to Tadlo Lodge to see the daily elephant washing show! 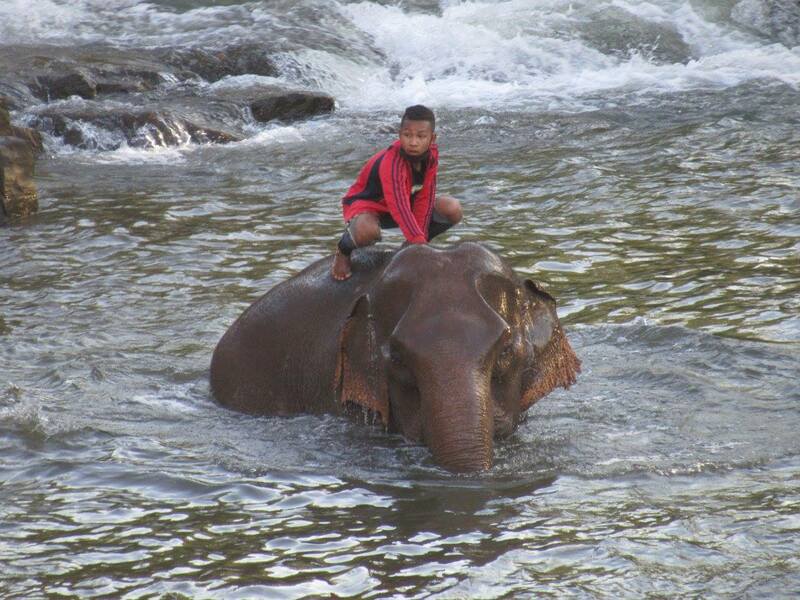 At 4.30pm the two young masters lead the elephants to the river where they slowly dive into the water. They looked happy… So was my friend Rafica, elephant lover! We took a bungalow and had rest for our second moto day. 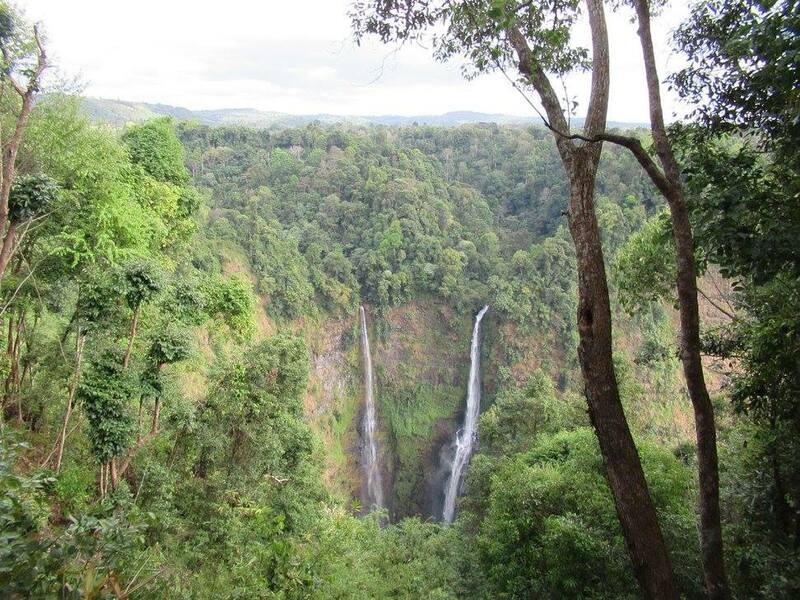 We first went to Paksong, passing through a devil road made of stones and dust, and arrived at a first waterfall: Tad Yuang. It’s the most impressive to me. Then we went to Tad Champi, the most famous because you can actually swim and pass under the waterfalls ! And we finished with Tad Fan where you can do canopy! Not on the map, so no tourist and free! To get there it’s the road to Tad Lo, next left after Tad Pasuam road! Entrance 5.000 for the scooter and 3.000 to get closer, on the wooden bridge. The biggest of the trip, 10.000 the entrance + 3000 for the scooter. Small but nice and there you can swim! 5.000kips the entrance + 3.000 for the moto. The deepest one, impressive but far. You can do Canopy though (around 50$usd). 10.000kips for the entrance and 3.000Kips for the scooter. From Paksé we took a bus to Nakasong and then a boat to Don Det. We found a room with Hammoks and direct view on the river. We passed two full days enjoying the island and its sister, Don Khon. 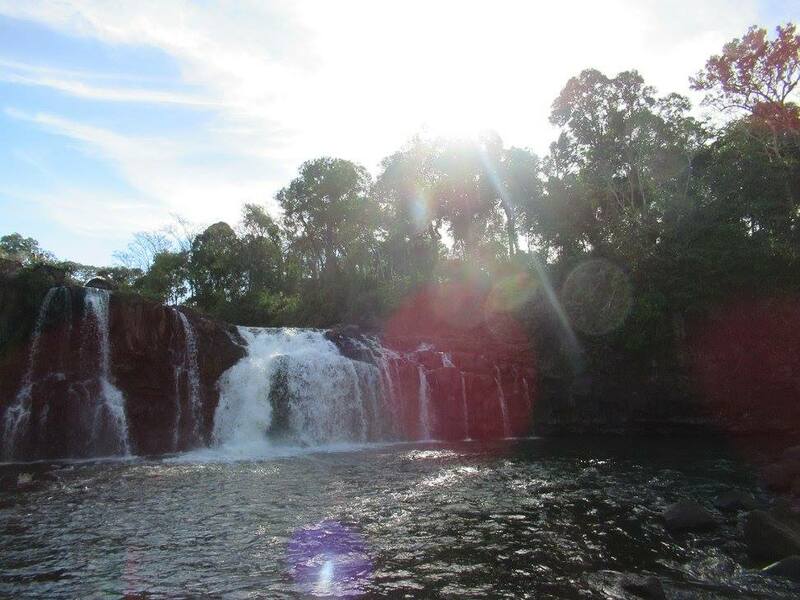 We enjoyed there the Li Phi waterfalls and the small beach right behind, where you can swim in the nice Mekong! We also found a very small and private beach and enjoyed the sunset on the west coast. So many nice people met on the way… Thank You!